Based on a true story, St Matthew Island describes the introduction of 29 reindeer to a remote Alaskan island free from predators and rich in food. The eight-page comic details the rise and subsequent crash of the herd’s population, as measured by field biologists. The comic leaves the reader to ponder the lessons humanity may be able to learn from the reindeer’s plight. A long-time favourite of mine, St Matthew Island is also the most popular comic available through my website. Something about the story loaned itself to storytelling through comics, and strongly resonated with readers. Storytelling is critical in comics, and science communication more broadly. We remember stories easier than we remember facts. Readers may forget details of the St Matthew Island story, such as dates or herd counts, but they will remember the overall chain of events. For many, the story lives on as a parable for humanity. Brought to paradise, the reindeer herd soared to an unsustainable number and then crashed. The irony is that the seemingly ‘perfect’ conditions of St Matthew Island (abundant food, no predators) were the very seeds of the reindeer’s demise. Our population is climbing at a rate comparable to St Matthew Island’s reindeer. But what is our ‘lichen’ equivalent? How big is the ‘island’ we stand on? Will we learn to curb our own excesses, or will we keep driving towards the cliff? On an artistic level, I’m fond of St Matthew Island for a number of reasons. Firstly, the reindeer serve as excellent central ‘characters’ to tie the story together with. Similar analogies, such as bacteria in a test tube, don’t have the same potential for personification as with the tale of St Matthew Island. Readers are more likely to identify with their fellow mammals than bacteria cells, and I drew the reindeer in a ‘cartoony’ style which increases the effect. Being a completist, I extensively researched the environment of St Matthew Island before beginning the artwork. This research included unearthing (some might say) minor details, such as the actual subspecies of reindeer introduced to St Matthew Island (the Porcupine caribou). Learning that fact gave me an idea of the shape of the reindeer’s antlers. The things I do for my readers! During this process I also learned the interesting fact that, unlike other deer, both male and female reindeer grow large antlers. Finally, through this essay, I have the chance to share such fascinating facts with the world! 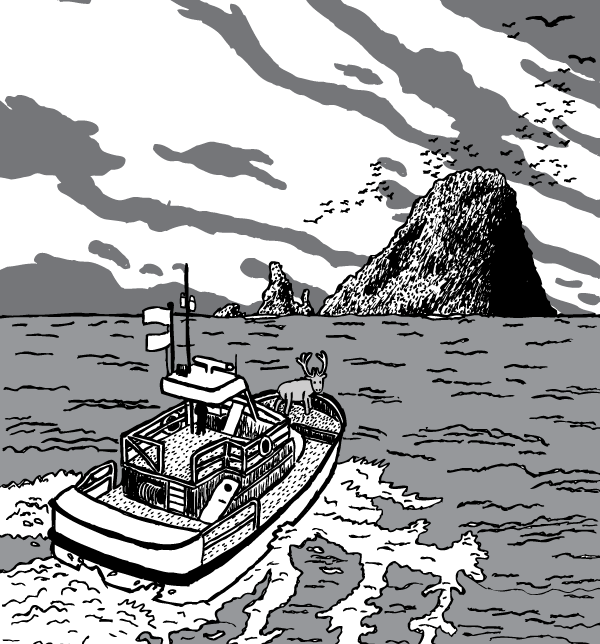 St Matthew Island may read like a fable, but it describes an actual series of events. None of the facts surrounding the population boom/bust of the reindeer is disputed, however there is some debate around the factors which contributed to the reindeer’s sudden demise. In the interest of fairness I will outline the main counter-points to the traditional story here. Climatologists note that the 1963-64 winter was exceptionally severe, based on regional weather records. No humans were present on St Matthew Island to directly observe ground conditions, but it seems there were weeks of freezing winds and snowstorms. It is likely a hard crust of snow would have hindered or prevented the reindeer from eating the vegetation below. 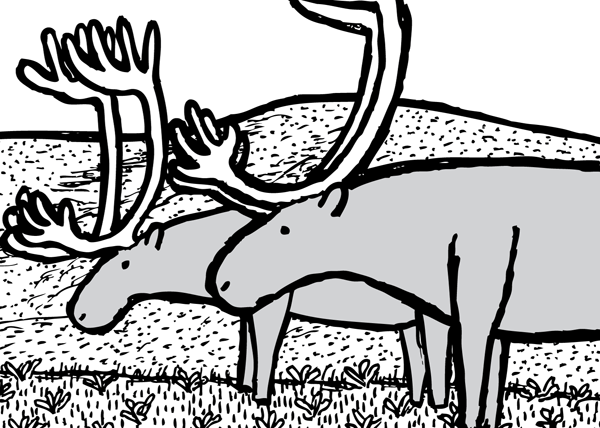 Miller, Barry and Calvert (2005) therefore argue that the reindeer population on St Matthew Island would have crashed regardless of the size of the population or the diet of the herd in the lead-up to winter. 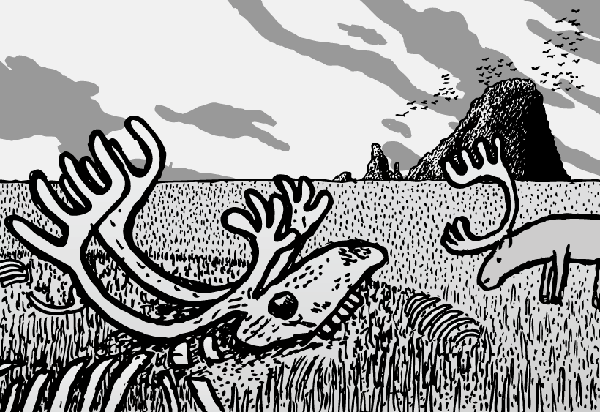 They also dispute whether St Matthew Island’s reindeer had actually reached peak population, and suggest that the population would have gradually declined (not crashed) without the weather laying the fatal blow. Being a fan of science, I welcome these challenges to the traditional story of St Matthew Island. I wonder, however, why the field biologist who visited the island, David Klein, put a higher emphasis on population size and overgrazing in his analysis of events. I also wonder why the revisionist article by Miller, Barry and Calvert seems so buried in the literature, despite the logic of its arguments. (I had not read their article until after publishing the comic). A non-scientific criticism of the comic is the ‘humans aren’t reindeer’ argument. I don’t think this argument debunks the comic. Yes, the human mind is capable of reason beyond any other creature on Earth. Yes, we have had a remarkable history of technological inventions. But these facts aren’t Get Out of Jail Free cards. Despite our creativity, despite our inventions, our success remains based on unsustainable habits and non-renewable resources. Humans aren’t reindeer for sure, but it’s dishonest for critics to ignore the fragile basis of our prosperity. Setting aside the scientific arguments, St Matthew Island has been responsible for some amazing changes since it began seeping into the public consciousness 40 years ago. Arguably its most important appearance was in Paul Hawken’s The Ecology of Commerce (1993). Hawken’s book about corporate accountability found its way into the hands of Interface carpet CEO Ray Anderson in 1994. As the inquisitive CEO read the book, the succinct paragraph about the St Matthew Island reindeer captured his attention. Anderson read the story and sadly realised that his carpet factories were sending humanity to the same fate as the reindeer of St Matthew Island. He had the sudden epiphany to transform Interface into a company which would operate using the principles of nature. Ray Anderson sadly passed away in 2011, but he spent his final 27 years radically transforming Interface’s operations. At an age where most CEOs retire to a ‘golf course’ lifestyle, Anderson busied himself chasing his goal of a company able to create and profit without plundering the earth. To his joy, immense reductions in fossil fuel use, waste and pollution led to immense increases in profitability, publicity and employee happiness. The reindeer of St Matthew Island may have been locked into a cruel fate, but people like Ray Anderson give us hope that humanity can consciously craft a different future. I hope my comics play some small role in creating epiphanies for the next generation of visionaries. Lovely depiction and caution about the winter effect as a factor. Will show it to my ecology class and link them back here. Hi Stuart, I recently returned from a trip to St. Matthew Island that I led for the U.S. Fish and Wildlife Service. We had Dave Klein on the trip, and he had a lot to say about the reindeer of St. Matthew. On the up side, Dave thinks that the lichens on the island are making a slow, yet steady recovery. However, I was doing work on neighboring Hall Island on this trip (where reindeer were likely very scarce or absent) and the lichens on Hall Island are much more abundant than those on St. Matthew. So, the recovery still has a long way to go! If you would like any further info on St. Matthew and our recent trip, please don't hesitate to contact me. Thanks for producing your comic. It is a very powerful story and I'm glad it's been captured in a forum outside the lines of scholarly journals and agency reports. Cheers, Marc P.S. We have lots of other great stories to tell here from the Bering Sea and the Aleutian Islands if you're ever looking for new material! !